Little orphaned Heidi lives a happy life with her Grandfather in the mountains, but is sent to live in the city, where a wicked Governess provides more than enough reasons for her to want to try and escape back into the country. Given their start in full-quality theatrical animated cartoons with MGM’s prestigious Tom & Jerry shorts, it always struck me as interesting that Bill Hanna and Joe Barbera never made a particular stab at reclaiming some territory in that arena after the MGM unit closed down and they went on to phenomenal success in the television business. Walt Disney naturally seemed to own the full-length animated feature market theatrically, but despite a heavy presence on the small screen, one couldn’t argue that he’s ever dominated the medium as much as Bill and Joe would go on to do. Sure, Disney pioneered much in the format, from initial specials, The Mickey Mouse Club, Zorro and especially Disneyland, the one-hour family anthology show most popularly known later as The Wonderful World Of Disney. Often these shows had special animated segments produced as part a certain week’s theme, to keep artists between features at work as much as to provide the audience with new entertainment, but the anthology and Club shows were, when it came to animation, largely made up of cartoons shorts compilations or the classic features split into two-part episodes. It wasn’t really until the 1980s, when the Disney Afternoon of such shows as DuckTales and other hit titles created a full block of programming designed to keep kids entertained when they got in from school. Unrivalled champions in this league already were the animated television shows of Hanna-Barbera Studios, a brand that took quite some time to becoming as recognized as their huge stable of characters and properties, but then grew to become so synonymous with animated television characters that the name almost became a byword for the medium (and still gets credit for a lot of non-HB productions). Yogi Bear, Huckleberry Hound, The Flintstones, The Jetsons, Jonny Quest, Wacky Races, Top Cat, Scooby-Doo, Penelope Pitstop…the list of truly classic and still enormously popular – with new generations and baby boomers – is literally endless. Many of the titles have become franchises themselves under the recent ownership of Warner Bros, from which new releases in the Scooby line still top the children’s home video charts and classics from the library continue to please older DVD collectors in special sets and via WB’s specialist Archive Collection of manufactured on demand discs. This initiative brings to DVD some of the overlooked gems that might not have otherwise made it to the format: titles that may not have been big hits, even in the VHS days, and sometimes probably never made it to tape or even LaserDisc either. 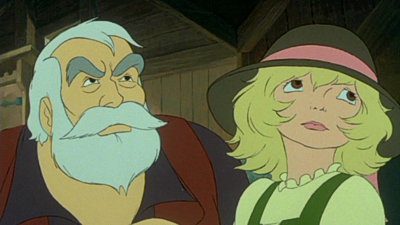 The latest animated release in the line restores some recognition to Heidi’s Song, a Hanna-Barbera feature from 1982 and largely long since forgotten. The company did make some initial forays into theatrical animated territory after Bill and Joe had left MGM, first with the shorts series of almost 50 cartoons featuring Loopy de Loop – rumored for Archive release for a while now, but still yet to show – from the late 1950s onwards. There were also legitimate feature outings for the Studio’s popular television properties, with Hey There, It’s Yogi Bear! and The Man Called Flintstone both attracting attention in the mid-1960s, and a reunion with classic Hollywood hoofer Gene Kelly, with whom Bill and Joe had created the famous Jerry Mouse sequence for Anchors Aweigh and an entirely brilliant animated third of Kelly’s Invitation To The Dance in the MGM days, resulted in a wonderful live-action/animated Jack And The Beanstalk, made for television but leaps and bounds above the quality the Studio was routinely churning out in the medium. 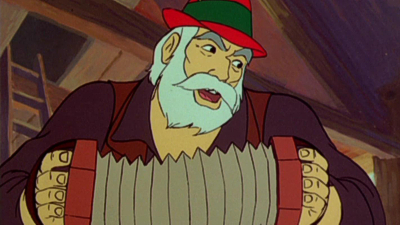 It wasn’t until 1973 that Hanna-Barbera would tackle a feature production again in adapting EB White’s classic Charlotte’s Web, beating their competitors Filmation to the screen with their take on the Wizard Of Oz stories. Charlotte’s Web is a bold attempt to try and mimic the Disney style, and even went as far as to hire that Studio’s songwriters the Sherman Brothers to provide the tunes, but for me the full animation just isn’t there; the movie struggles as a result and the music, despite including the Sherman’s own favorite song, slows down the action: it isn’t a patch on the much later and surprisingly effective CG/live-action version featuring Julia Roberts’ voice. In retrospect, it seems Bill and Joe’s ambitions might have been curtailed rather than them becoming quite content to dip their toes into the feature animation market once every ten years or so (especially as this very interesting article by John Canemaker on the making of Heidi’s Song and the future of the company). The animation renaissance of the 1990s saw them more productive with The Jetsons and Tom & Jerry: The Movie, but these were far cries from the glory days and pale imitations of what they had done so much better years before. There was a last-ditch attempt with the eco-friendly Once Upon A Forest in 1993, a sweet film but one so insubstantial that there isn’t one mention of it in lead voice and Phantom Of The Opera star Michael Crawford’s autobiography. 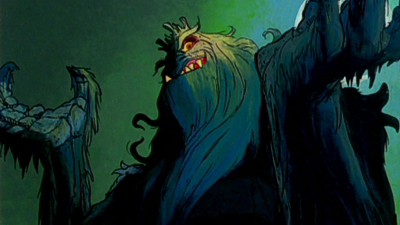 Forest’s poor box-office showings put paid to any further plans, before Hanna-Barbera was swallowed up by Ted Turner and the unit was spun off into the Turner Animation company that would create the animation for The PageMaster and Cats Don’t Dance, before itself being bought by Warner Bros, who now control all those properties. So the list of authentic Hanna-Barbera theatrical features is ultimately a surprisingly short one, but for my money they never really beat themselves more than with Heidi’s Song in 1982. I remember this was a no-show year from Disney, and several other distributors were trying to muscle in (again) on the House of Mouse’s monopoly. The likes of some of Ralph Bakshi’s pictures and such films as Watership Down demonstrated that other producers could equally release animated films and compete with the mighty Disney, whose output especially in its live-action comedies was seen as having lost its allure. 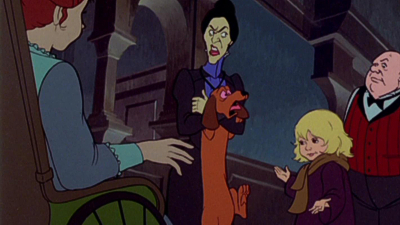 Even its animated division had taken a knock: the Disney Studio walk-out of Don Bluth and several animators indicated a quality slip, and Bluth was eager to return to the core values of classical Disney animation from the Walt days. In 1981 Disney’s The Fox And The Hound was as warm-hearted and actually as little more edgier and contemporary than usual, but it had shown the company was perhaps stagnant in its pure creativity. 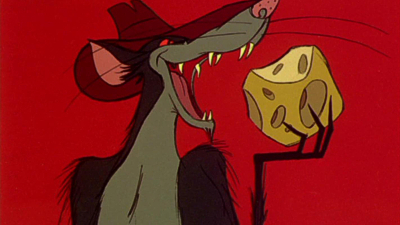 A year later, Bluth was back with his adaptation of Robert C. O’Brien’s Mrs Frisby And The Rats Of NIMH, the famed and very rightly respected The Secret Of NIMH, and was making big splashes in the animated feature world. NIMH had unfortunately gone up against a little film called E.T. The Extra Terrestrial in the summer of 1982, but had been a moderate hit and so great things were expected of Hanna-Barbera’s much trumpeted return to the big screen. I remember much fuss being made about the release of Heidi’s Song: the poster seemed to be everywhere…but the movie itself was much more frustrating to find! 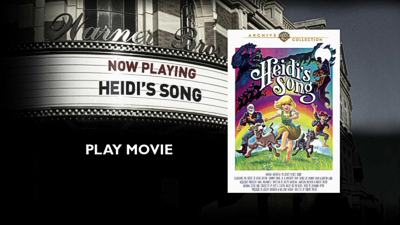 Originally released by Paramount Pictures, Heidi’s Song quickly disappeared from view, seemingly from every media format and even some folks’ memories! I’d been lucky enough to grab one of the soundtrack cassettes released at the time, so even though the film had over the years apparently been erased from existence I still had the tape with its lavishly drawn poster image and its catchy, Sammy Cahn-lyric songs. Now, after an interminable wait to see if the movie was as good as I remembered it, Heidi is able to sing again thanks to WB’s issue of the film on DVD – well it’s about time! Heidi’s Song has actually stood the test of time pretty well, even if its production techniques (and I don’t just mean the fact that it’s hand-animated) and approach is what slightly dates it, if anything. As a test, I watched it with a ten-year-old girl of today, one raised on a diet of contemporary TV cartoons alongside such feature animated fare as The Princess And The Frog and Tangled. I was interested in that she didn’t twitch as perhaps I did, when some of the more basic Hanna-Barbera-isms sometimes crept into the storytelling. Co-written by Joe Barbera, comedy scripter Jameson Brewer and director Robert Taylor, based on Johanna Spyri’s original novel, the plot sticks relatively well to the book, as far as I can tell as someone who’s only previous exposure has been to some of the other film and TV versions over the years. One of the most filmed stories, Heidi has been a mainstay on movie and small screens since a 1920s silent shot film and, in particular, the famous Shirley Temple starrer of 1937. Since then the novel has been adapted countless times in the 1950s and 60s, with television mini-series and movies appearing in the 70s, including two Japanese animated versions, a Disney edition in 1993 and further versions in the works even now. They all follow the same plot, of course, in which the little orphaned girl Heidi is sent to live with her grumpy Grandfather before being whisked away to act as a friend to a privileged but invalid girl, Clara. Their schoolmistress governess provides the impetus for Heidi, who longs to return to her Grandfather, to stage an escape with Clara, which brings about its own complicated turn of events before a naturally happy ending resolves things. 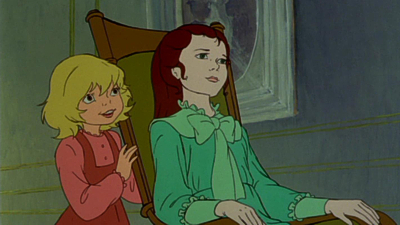 Since the tale had been told so often in live-action before, the Studio here inserts several sequences that could only have appeared in an animated film, and none of which slows the action down. With Heidi freshly settles in at her new mountain home, her first night of nerves plays tricks on her in a pretty spectacular “Nightmare Ballet”, where the creatures of the night come to life in her mind. Coming pretty early on in the film, this is easily a highlight in terms of animation, whereas a later fantasy sequence in which Clara imagines dancing with her secret love, is a little more low-key but a natural inclusion in terms of story. 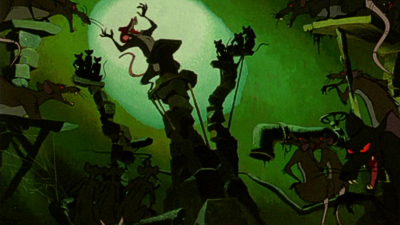 Lastly, a basement of rats adds to the later scenes, particularly Sammy Davis Jr’s Head Ratte, the leader of this rat pack (sorry!) who gets to sing a toe-tapping number as the rodent threat increases to Heidi and Clara’s escape plans. 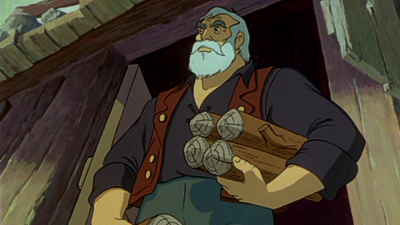 Davis was a big catch for the film – it’s his only animated vocal as far as I know – and his late entry character peps up a film that could have started to feel a little longer than it needed to be. Of the other voices, Margery Gray makes for a Temple-like Heidi but without being overly cloying, while Ben Cartwright and Commander Adama (depending on your ages!) himself, Lorne Greene, plays the by turns cantankerous and exuberant Grandfather (for which any small matter seems to be a reason to have “a celebration!”). Their characters are brought to life under the watchful eye of Taylor, an interesting choice of director after his then-recent last credit, the decidedly different Nine Lives Of Fritz The Cat. However, by the time of Heidi’s Song, Taylor was much more well versed than that, having spent time at the studios of TerryToons, DePatie-Freleng and Hanna-Barbera as an animator before moving into designing and directing for HB and other studios (including Bakshi’s) and a later career as a Disney producer on their television output and the DuckTales spin-off feature. Here, his “outsider’s eye” brings a new and fresh approach to Hanna-Barbera’s production process, a process that is stretched beyond the normal limits by a need for full-quality theatrical animation. If there was ever a Hanna-Barbera production that could stand alongside the likes of those from other studios, it’s Heidi’s Song. If anything, one might say that sometimes the film feels over-animated, and I am reminded of Glen Keane’s wryly amusing questioning of how animators can convey sincerity: “Do you lean harder on the pencil or something?” There’s very much a feeling of that here, with some of the lines overly fussy, like the artists really are leaning on their pencils to get every inch of sincerity and quality out through their hands. It just about works, since the whole movie feels like this: if it had been limited to only certain scenes or characters it would look disjointed; instead, it just feels part of the visual approach. And speaking of visual approach, where Heidi’s Song scores big is in its layouts and backgrounds, which really evoke the golden era of animation rather than the bland and block-color customary to Hanna-Barbera productions. Unexpectedly detailed and full of color, the environments really provide the production value, and if the characters start to lapse into predictable characteristics or the plot into a silly little aside, there’s always something to catch the eye and hold the attention. In many ways, it seems Hanna-Barbera really pushed the boat out with Heidi’s Song and wanted to impress with a big hit. The film is underrated to be sure, but maybe its slight story and limited release served to be opposing factors in its box-office fortunes. The film certainly has its fans out there that remember it fondly, and hopefully Warners’ new disc will do more than just appeal to those now-grown up people yearning for a bit of childhood nostalgia. 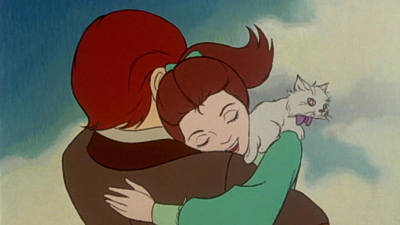 As I mentioned, Heidi’s Song played well to someone who has loved the kinds of films The Princess And The Frog and Tangled were, but did it live up to the memories for me? Well, in many ways yes, and I was surprised at how un-Hanna-Barbera the film often seemed. It reminded me most of the kinds of Bluth-styled films that came along later in the 1980s and 90s: perfectly well-crafted fare if a little inconsequential. 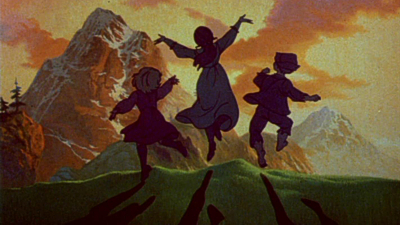 But by no means unimaginative, while it could be said to fit in with that cycle of movies, it is also true that Heidi’s Song does it better than most. While a trailer was naturally produced for theaters leading up to Heidi’s Song’s release, it has not been included here, very unfortunately. This is a great shame, as I’d love to have seen how it was promoted, but is also perhaps understandable: the movie was originally presented by Paramount Pictures and it could be that their logo or other copyright restrictions prevent its inclusion here. I actually doubt that, but it could be a factor as to why Warners haven’t bothered to transfer it here. As such there are no bonus features whatsoever. Following the more recent standard Warner Archive Collection design, the sleeve sports the original theatrical poster on the front and a uniformed image and description assemblage on the back. It’s great to see the colorful poster again – quite literally! – all it seems WB has done is found a poster and reduced it in size, since the fold lines where it has obviously been stored are fairly easy to pick out. Surely using another source or spending a little more time in Photoshop would have smoothed out some more of the creases? It’s not as bad as it could be, and many might not spot them, but having a poster fold line right across your heroine’s face like some sort of scar really isn’t that appealing! What is nice is that a section of the same artwork has been applied to the disc itself, a rarity when the Archive Collections usually sport a uniform blue look, although again one couldn’t help but think the rainbow’s circular contours might have been much better applied to the round disc instead of the cut and paste aspect to the image. I’m also unsure about WB’s dropping of the regular DVD logo: either this is because the DVD Association has argued that these Archive discs are not standard DVD Video release or because Warners doesn’t want to pay the license to use that logo. Whichever it is, it looks cheap, and further reduces the “legitimacy” of these Archive Collection titles. 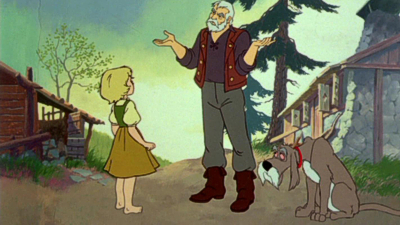 Presumably created to a 1.37:1 open matte negative for future presentation on television and video, this remastered edition of Heidi’s Song is given its full 1.85:1 theatrical framing. The results are pretty good: certainly the image quality is as good if not better than expected, but the masking of the top and bottom of the image (again, just as it would have been seen in theatres) does sometimes bring the quasi-dual framing aspect into question. Occasionally character heads can become cropped and the framing cramped, but on the whole the film looks pretty well balanced and a lot nicer than one would expect for a Hanna-Barbera production. Once again, that John Canemaker article linked to above suggests HB were really intent on pushing the boat out and making their film look good: if nothing else, this WB Archive release makes sure it does. Although Dolby Stereo was in much wider use by 1982 it was also still something of a novelty. There had been others before, but Star Wars, in 1977, had really pushed the limits of what movie soundtracks could do in putting the audience right into the action sonically, and any animated film that could boast a Dolby track was certainly seen as something prestige. For Hanna-Barbera it was largely money well spent: the track has been carried over here and represents a sprightly, engaging mix where Hanna-Barbera regular Hoyt S. Curtin’s score gets a chance to shine and the vocals don’t overpower the sound design, always something of an issue with those usually involved in television production where the voices are often pushed to the fore a little more to make their mark on tinier TV speakers. Perhaps a little limited by the recording techniques of the time, there’s nothing else to worry about here: it’s a suitably nice track. 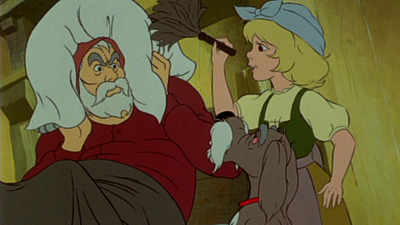 Heidi’s Song didn’t change the face of animation or even make Disney sit up and notice in the way later films from Don Bluth did, but it ranks up there highly as one of the better such films to try and come along and, if not steal the Disney crown, then at least wear it for a little while. 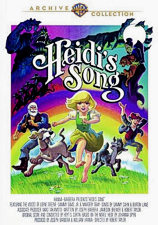 With the popularity of the Disney films in the late 1980s and 90s, there was a rush from other studios to try and get in on the act: Heidi’s Song comes from a slightly earlier and more innocent age but stands up much better than those later Mouse House wannabes. It couldn’t really be called an “animated classic” in any other way than that it has now reached a vintage age and is based on a 100+ year-old story, but it does deserve to be much better remembered than it has been. 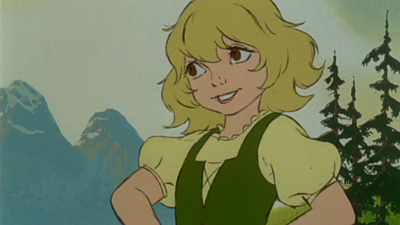 In fact Heidi’s Song is a very nicely achieved version of a popular story, with all the animated musical touches one might expect and several other craft-aspects that many certainly won’t be expecting. It might not reach the epitome of Hanna-Barbera’s more well-known character writing, but artistically this Heidi really sings. This entry was written by kelvin, posted on September 30, 2012 at 1:50 pm, filed under Animation. Bookmark the permalink. Follow any comments here with the RSS feed for this post. Trackbacks are closed, but you can post a comment.